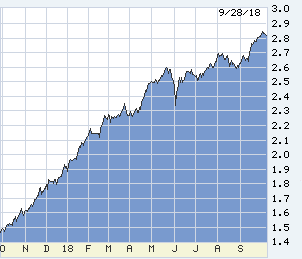 The Fed this week raised the overnight cost of money to 2.25%, the “prime” rate rising mechanically everywhere to 5.25%, and the Fed signaled additional .25% hikes every 90 days until the economy slows — and long-term rates went down. 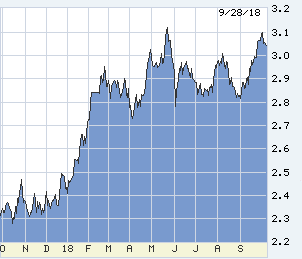 Not down by much, but the all-important 10-year T-note fell back from its crucial 3.10% level to 3.04% this morning, best-quality mortgage borrowers still finding loans in the fours. A request of citizens… please for a moment tear ourselves away from the parts of our government not doing well and consider two parts in which we should take pride. And for comparison a glance at self-government overseas. Start overseas. Italy is trapped in a currency regime which it should never have entered, nor Germany have invited the fiasco. Italy’s newest government last night stepped toward first-class European crisis by voting for a huge increase in spending and deficit. Austerity in Italy is no longer politically sustainable, and Italy unlike Greece is too big to fail or to bully. Let markets talk: the Italian stock market has lost 3.72% of value overnight. Its 10-year bond leapt from 2.89% to 3.14% — about the same as our yield, but in payable euros. Thus compare to German 10s, whose yield dumped from 0.54% to 0.47%, cash running there for safety. That yield divergence in one common currency and trade zone? The market says it won’t be one zone for long, no matter how unfairly Brussels batters the UK for attempting escape to status quo ante euro. A common market, as it was before, not a Euro-prison. Lest complacency overtake us here in the US as mortgages dodge Fed bullet after bullet, we did so today because of Italy. And elsewhere overseas, central banks are raising their rates to defend their currencies from our Fed, not because of their internal circumstances. The Fed may get its slowdown by indirect means and surprises. Good government here: the Securities and Exchange Commission yesterday affirmed that officers and directors of public corporations still may not mislead the public. Elon Musk will fight it for a while, but no matter what a darling of technology he may be, nor today’s fancy for twitter-blabbing, a CEO may not say that he has funding to take his company private at an inflated share price when he does not. Thank you, SEC. Then, in superb performance by government: the Fed and the person of Jerome Powell. The Fed is in a box — always, but they vary. We do not have ramping inflation nor the wage growth on which to ramp, and the Fed does not have clear reason to damage the economy. However, we have every imaginable condition precedent to overheating. It is not the Fed’s job to bet on inside straights. It must play odds, and the odds are enormous that GDP growth north of 3% and 200,000 new jobs each month will sooner or later end poorly. The Fed must act to pre-empt, and hope for a soft slowdown. 1. Powell has cut the post-meeting statement in half, and cut it further this week. He removed this line: “The stance of monetary policy remains accommodative, thereby supporting strong labor market conditions and a sustained return to 2 percent inflation.” Out with that. And then in Q&A, delightfully straight, said that the Fed’s current rate is still accommodative, but policy is no longer. 2. Powell: the economy is in a “particularly bright moment.” Historically, when a Fed chair speaks this way, hopes for long-term rates to stay down are just whistling past the graveyard. Then Powell spoke in unprecedented fashion. 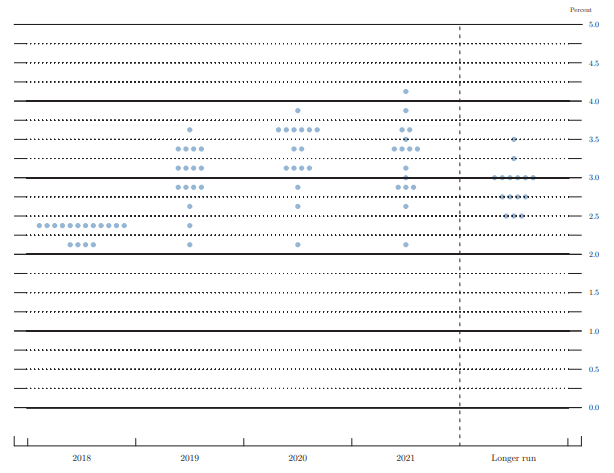 Previous Fed chairs have spoken critically about actions by other branches of government, but usually reluctantly while under pressure in testimony, or in oblique published remarks. Five weeks before an election, take shots at Congressional and White House policy? Never, ever. 3. Powell took on directly the White House trade war: "We've been hearing a rising chorus of concerns from businesses all over the country about disruption of supply chains, materials cost increases. If widespread tariffs remain in place for a long time, that’s going to be bad for the U.S. economy.” Yeow. Powell’s use of language is precise on any subject. “Uniquely expensive.” Not “underfunded,” expressing a need for more tax revenue. Nor any suggestion that we are trying to cover too many people, and that cutting numbers or coverage is a solution. “Uniquely” in full understanding that we spend almost double the health budgets of peer nations with the same result. And absolutely dead flat on center that overly expensive care is the cause of our fiscal distress. US health care “delivery” costs too much.